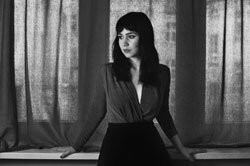 Looking like she walked straight out of a David Lynch movie set, the seducing LAURA CARBONE entices with her sharp lyrics, dark melodies and a twist of 80s/90s dark wave pop from the gospels according to PJ Harvey, Laura Branigan and Chris Isaak. Once the lead singer from Germany electro-punk outfit Deine Jugend, Laura Carbone's debut solo album Sirens is a clear musical awakening with stand out tracks like Heavy Heavy, Swans and Stigmatized. This album clearly walks on the dark side of pop street and brings a freshness which is unparalleled to the chewing gum rock 'n' roll scene. Working together on her album with her producer Bonassis (formerly a member of death metal band Pyogenesis and Liquido) in Audiodrive studio near Mannheim, Laura has developed her style with an honesty and maturity taking in all her own influences. Sirens represents the mythological beauty and danger with a string sense of feminism which becomes a much fitting title for this piece of work. After her experiences with Deine Jugend and the naivety of her youth in the music industry, Laura herself supported this entire project with a very successful crowd funding campaign to keep her independence as a true artist.